The price shown above is for a pair of our standing horns. They have turned 3/4" diameter shanks, lift the loom of an oar about 8" above the rail, and are 2" capacity. That's a hefty bit of silicon bronze. Like our other oarlocks, these are machined castings, which means that the shanks are turned, the oar seats polished, and they have lanyard holes drilled. Sockets are not required, and an installation page is included with every order. Why standing horns? 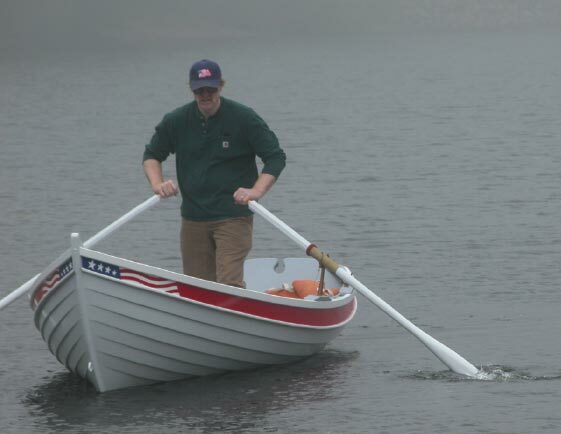 To raise the fulcrum point of your oars sufficiently so that you can stand and row, like this...And why would anyone want to stand to row? For one thing, when you're standing you can see what's under the surface, making it easier to navigate close to shore. For another, it is easier to navigate close quarters when you are facing in the direction you're rowing. Standing oarlocks in a Christmas Wherry. Unfortunately, our standing horns are out of stock for the foreseeable future. Stand-Up Oar Locks - Wow!